Son of Albert and Ann Pugh, of 5, Dynevor Terrace. Nelson. Cardiff. Enclosure No.4 XIV. AA. 19. Reginald PUGH is also commemorated on a family grave (above). From the family headstone it can be seen that Reginald’s mother Ann died at 49 years of age on 5th April 1921. His father Albert died on 3rd September 1946 aged 79 years. As recorded on Commonwealth War Graves Commission database, Reginald Pugh lived at 5 Dynevor Terrace, Nelson with his parents Albert and Ann. Albert and Ann were married in Pontypridd in April/May/June 1893. Reginald was one of at least four children born to Albert and Ann. Idris David was born in about 1900. Records show that the whole family were bi-lingual, speaking both Welsh and English. Reginald’s father, Albert was born in Battle in the parish of Llanfilo, Breconshire in Oct/Nov/Dec 1865. He was a coal hewer (coal miner) in 1901. He was born Albert Christmas Pugh to Samuel and Elizabeth Pugh. Samuel was a cooper and in 1871 Albert was listed as a ‘cooper’s son’. In 1881, Albert was working as a labourer alongside his brother Evan at a farm in the Brecon area. Reginald’s mother, Ann, was born in the Llanfabon area to David and Elizabeth Edwards. Ann had a sister called Catherine who was three years older than her. In 1881 the family lived at Tai’r Machine, Nelson and in 1890, David and Elizabeth had another child, Bessie. Both David and Elizabeth were born in the Llanfabon area in 1847 and 1837, respectively. David’s parents John and Mary were also from the Llanfabon parish. 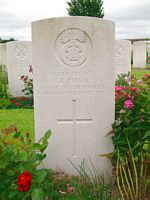 Mr and Mrs Albert Pugh, 5, Dynevor Terrace, Nelson received an official notice on Wednesday stating that their son Private Reginald Pugh, Royal Welsh Fusiliers was killed in action on Sept 26th. 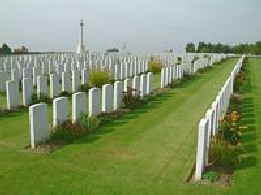 Private Pugh was only 18 years old and enlisted in March 1917 and had only been in France since the end of June. He had been employed at Penallta Colliery.